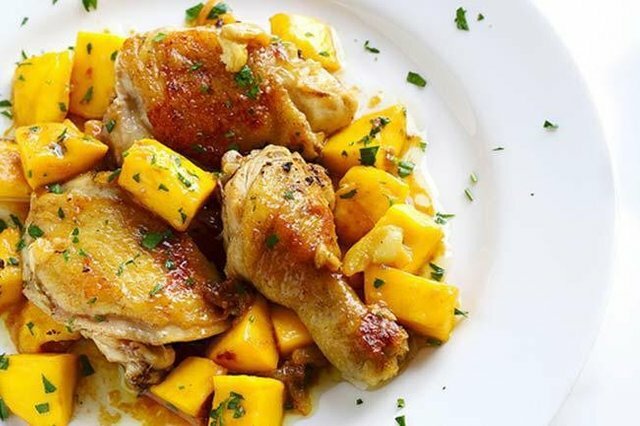 Mango chicken is cooked with mango and chicken meat. Chicken Mango is delicious as well as nutritious to eat. Salt taste and peppercorn little. Heat oil in a large pan or frying pan with medium heat. Keep stirring with onions and capsicum until it is soft. When softened, add ginger, salt and garlic and take 1 minute and bring it yellow and cumin. Take a few moments of vinegar, coconut milk and a mango tree. Reduce heat and cover 15 minutes. After that, remove from the oven and mix well with this sauce blender and mix it again in the frying pan. Give meat and raisins in sauce. Reduce heat and cover the lid for 10 minutes. If the meat is boiled, cover the rest of the pieces with a little less heat for 2 minutes. Serve hot with hot pepper and serve hot rice. Great! That looks super tasty with mango in it, must be sweet and salty together. Delicious and I feel like enjoying it.